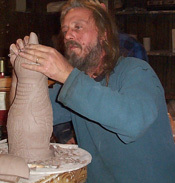 hand alters the clay body of the pot. This process is done while the clay body is still wet. has a ribbony or twisted affect. to a finished piece altering the clay body to achieve artistic affects. a semi dry clay body. gently carve your design in the clay. Caution: Take care to not carve too deep. Deep incisions can puncture the clay body. 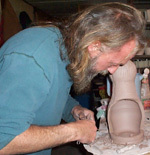 Ken uses a small turning wheel when carving. The trees in this piece were altered by pushing the clay body out.